These past few months, I've been into corn like never before. It started with the Momofuku corn cookies, and my love intensified with chilled corn soup and blackberry-vanilla ice cream pie with corn cookie crust. Corn often gets a bad rap, especially when it's processed into high-fructose corn syrup. But that and other processed corn products are derived from field corn. Sweet corn, the version you can buy fresh and cook yourself, is really a different crop, a healthy food full of fiber and antioxidants. 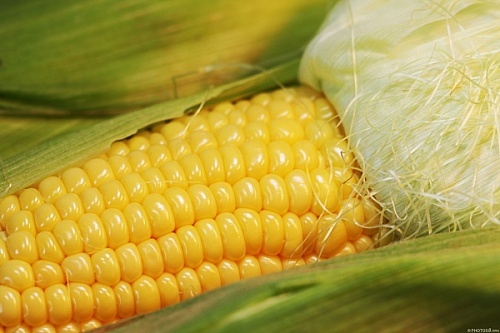 This week's recipes will feature fresh farmers market sweet corn, which is plentiful and available now. I have a corn risotto with fresh tarragon, a puffy corn pancake with blackberry sauce and a special dish that combines the flavors of macaroni & cheese with corn pudding, which I call "macorny and cheese." Corny, I know. To start, here's the simplest and one of the most satisfying ways to prepare sweet corn: classic corn on the cob. When picked at the height of the season, good sweet corn doesn't need butter or salt to make it taste good. So if you're used to drenching it as such, try withholding for once to let the corn's inherent sweetness shine. The recipe is as basic as can be: you boil it. But it's not foolproof. Cooking it too long will make the corn mushy. A lot of recipes say to boil the corn about 7 to 8 minutes. I stop mine at 6 to ensure the kernels still have adequate structure. Al dente, if you will. Also, if you do feel the need to salt your corn, don't throw the salt in with the boiling water, as it can make the corn tough. Add ears of corn to a large pot; do not put in more ears than can fit on the bottom of the pot without overlapping. Fill with enough water to cover the corn by an inch. Remove ears of corn. Set pot on stove and bring water to boil. Add corn and cook 6 minutes. Remove corn and serve. What makes it bad is when they processed corn and turned it to high fructose corn syrup. This sweetener has lots of negative publicity and evidence that it is harmful to our health. Thanks Catherine. I completely agree. In our house, we've eliminated most products that contain HFCS. Why would anyone butter sweet corn? There's absolutely no need.